Rearrangement of the form: We've rearranged the order-request form so that mandatory fields are all along the left. 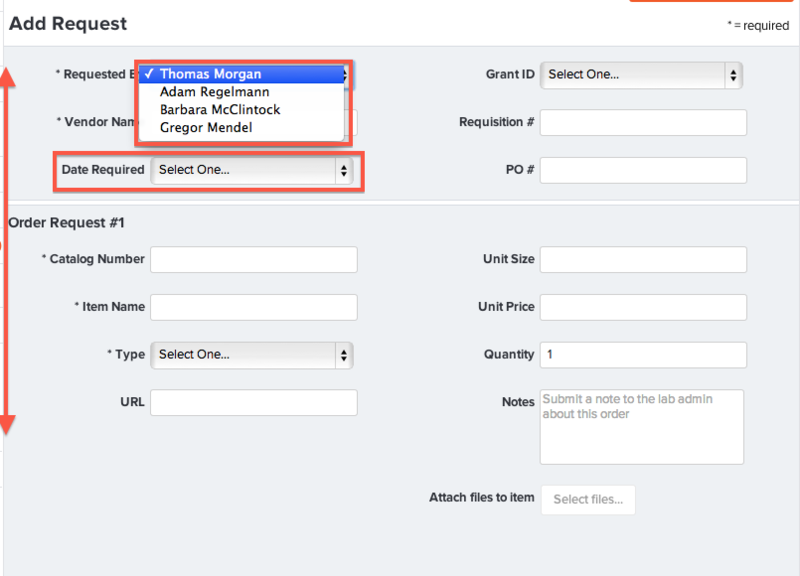 This ensures that you can quickly fill the mandatory fields and submit the order request. "Required by" is now optional: This tweak was requested by many people. Some labs want the lab-admin to set the default option here and that is something we may develop in the future. "Requested by:" Admins can now place requests on behalf of other members. The use-case is that a PI (or other members) may prefer to communicate order-requests as they've done in the past. The lab-manager can then enter the order-requests on their behalf thus allowing them to track the status of the order on Quartzy. Time-zone set at Group-level: Previously, each piece of equipment in a Group could have its own time-zone and due to an occasional entry-error by members while adding new equipment labs would have a situation where some instruments were in an incorrect/different time-zone. This led to incorrect sign-up reminder emails etc. We've resolved this by allowing Admins to set the time-zone once for the entire group. This time-zone will be the time-zone for all the shared equipment in that Group. To change/edit the time-zone for your Group please click the Groups tab and click 'Edit' against the name of the Group.